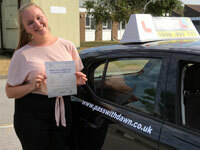 I passed first time with only 2 minors with Dawn's LDC Driving School. Dawn and LDC were both recommended to me by three separate people so I looked further into their methods. The use of the workbook and DVD were very appealing to me and, as I knew very little about driving or cars, these gave me the confidence each lesson to try new things. That I could read up and watch the DVD before our lessons helped me immensely. Finding the right instructor was a very important part of learning to drive for me. Once I had contacted Dawn, we arranged for her to visit me to look at the different courses available and after this, I knew Dawn was the right instructor for me. Her patience and friendliness kept me going! We went at the pace that suited me and if I didn't understand something we would keep working on it until it clicked. She wasn't just teaching me to pass the test, she was teaching me to be a safe and confident driver. I would recommend Dawn and the LD System to anyone I know who is wanting to learn to drive. I cannot thank Dawn enough for the support she gave me and fun times we had! 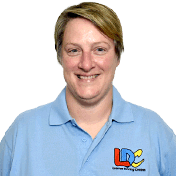 I'm a driving instructor in Brighton, Hove, Portslade, Southwick, Lancing and surrounding areas.